I didn't realize the original thread was in the prototypes forum, so I'm posting here where it seems more relevant. I played around with this a bit. I used the Moon Patrol idea from Daniel, the enemies from Jess, replaced SELMA with ATARISOFT, and changed the title font a bit. This is the first time I've tried any hacking with a Coleco rom, so it's been interesting. I do everything with a hex editor which is a pain, but I'm sure there are easier ways. I'm not yet sure how all colors are handled. It seems pretty simple for sprites, but I've not been able to locate the gray background yet. I'd like to see the gray background changed to black and the status display changed to blue like the arcade. I thought about changing the round hills to be a bit more pointed, but I don't really mind them the way they are. It looks great! I gotta know, though... how did you manage this? 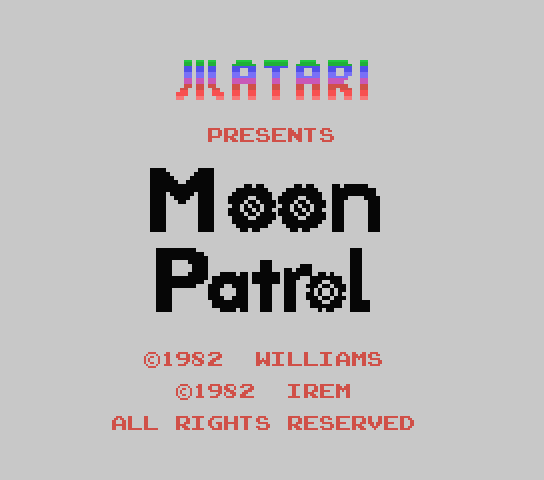 The best I could do with the title screen is change it to "Maoo Patrol." I could never figure out where the pattern of the tiles was; only the graphics for the tiles themselves. Is this a screen title only change, or were any other changes made? If he incorporated the changes I made, the enemies are probably different, too. That means no more Devo hats or flying bras! Well, I just looked at Daniel's example. Simple as that, really. At the risk of sounding too obvious, it's just repeating the second sprite instead of the third. I'm afraid I'm not a high-speed coder like a lot of you guys (yet), but I'm fairly competent with a hex editor. What I do is really much more primitive than some people think. As long as I can compare two roms, I can look for patterns until I figure out what's going on. It's a slow and tedious process with a lot of trial & error, but it works for me. 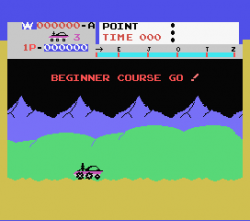 This is how I got started hacking 7800 games as well. For that system, I used the Pac-Man Collection editor to make small changes to sprites until I understood how things were arranged. Now, I can hack 7800 games with little effort (relatively speaking). 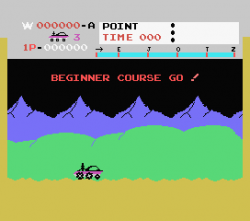 Concerning colors, I saw that each Coleco color is numbered 1 through 16, so the gray is 14 or 0E in hex. The Moon Patrol text (black being 01) was really easy to find and change to cyan (07), but apparently the background colors are a different story. 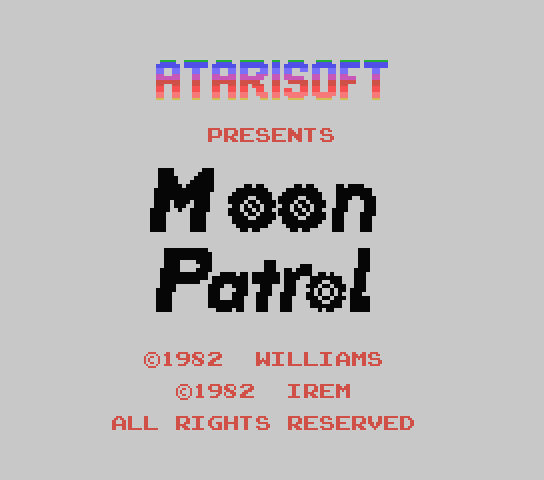 I also found the color for the graphic in front of the animated rainbow that makes the "SELMA" or "Atarisoft" text, so I can make it black. However, I've not found the background which I presume is probably also the same instance for the game selection screen and the in-game status bar (and I searched pretty thoroughly). I'd love if someone with more skill could change those so we could have a screen closer to the mockup Luc posted. If the background color is the same instance for the status bar, then we'd just need to change the black text to something else. Again, that shouldn't be much trouble. I could be wrong about some things and I probably sound a little silly saying these things to guys who actually know how to program on the Coleco, but like I said -- this is my first Coleco game hack. I compared your sprite changes to the arcade and yours is pretty much arcade perfect (for being one color), so I used your sprite changes in all four rom variations. I'm not sure if this would help you with the hack. 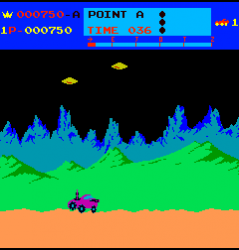 I programmed a program that view the image from the hex data from Moon Patrol. It's for the Colecovision, pretty much the platform I could program for at the moment . It pulls the data from the hex data and load them to the char set and the sprite pattern. You can push up and down to scroll increase the pattern number 0-256 into a single box. Left and right to scroll the ROM data up and down. 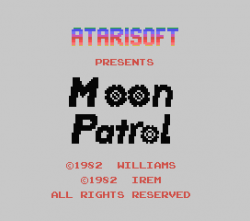 You can see multiple of copys of the Moon Patrol, level data and etc. Game loop observation, the border is being called 2 times before it reach the end of the line. I finally took another look at this. 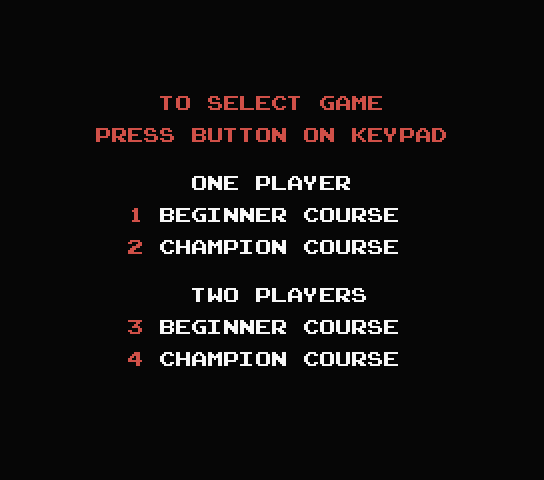 I've got the title screen and game select screens with a black background -- and in two flavors (Standard title and Tilt title). The game boot up color is now black as well. I started working on the colors for the in-game status bar, but I'm out of time and could use some help finishing up. 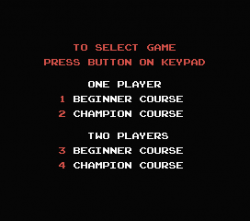 - Change the blank-game-start color to black (the color that flashes for a second when a game is started). 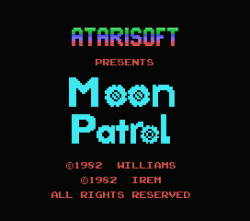 - Finish changing the status area background color to blue in order to mimic the arcade. A big thanks goes to Kiwi for his clues about colors. Knowing that the colors 06 and 0E could be combined to 6E was a big help. Initially, I was still stumped, but just today I realized that "00" also produced gray the same as 0E. That was the answer for some of those background colors. BTW, what program is best for debugging/disassembling? I've tried BlueMSX, but I can't get the debugger working. I also tried Meka, but couldn't find the debugger there, and I don't know of Colem having one at all. Edited by KevinMos3, Wed Oct 30, 2013 12:34 AM. This is great. I always thought that Joust could use a title screen as well. A color-cycling border like the arcade would be great. There is a rumor going around that someone found a prototype with the sound but not sure if that person is going to give it to the masses or not yet. Great job on the further hacks and thank you for sharing. One thing that I would consider changing in this latest round of hacks is reverting back to just "Atari" with their logo as well seeing as all their officially released CV games did not state "AtariSoft" on the title screen. "There is a rumor going around that someone found a prototype with the sound but not sure if that person is going to give it to the masses or not yet." I'm a little confused. My versions all have sound fx and music. You mean the versions you have are soundless? 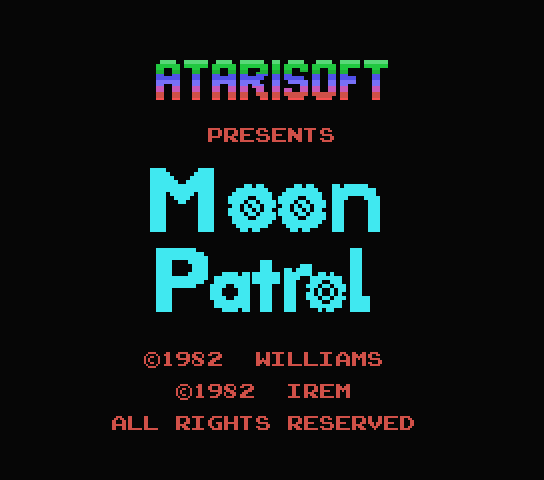 Btw, I like the title screen with the slanted MOON PATROL. edit: Oops, I see that you guys were talking about Joust. Sorry. Edited by ChuckH, Thu Oct 31, 2013 4:21 PM. BTW, I have managed to complete KevinMos3's first to-do above and so am now focussing on the status area changes. Made some good progress but struggling to change the high score stage letter colour - that's the last thing needed for the status area. Success - the little sucker was hiding earlier in the rom file away from the area in the rom that dealt with the bulk of the status area. 1. Current player number should be yellow. 2. The dash after the "P" should be red. 3. The number of lives left should be yellow. Unfortunately, there are restrictions that have prevented me from changing items 1 and 2. The colour of the current player number has to be the same as the high score, i.e. changing a single hex value affects the colour of both and so I have kept it as medium red. The "P" is dark red as set by Matt Householder. Similarly, changing the colour of the dash affects both dashes at the same time so I kept them as black. I can change the colour of the number of lives remaining. Currently, it is magenta - should I change it to yellow to match the arcade game? 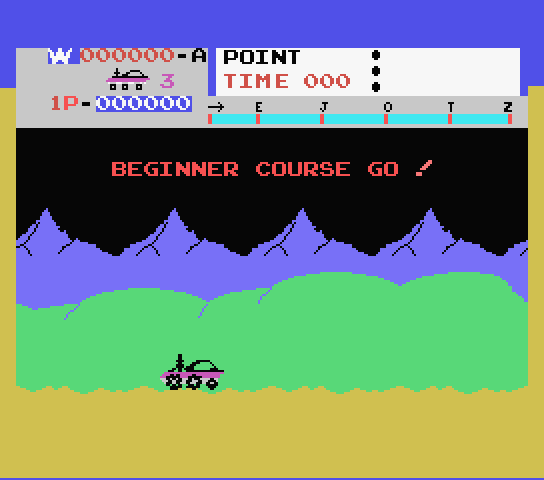 An example is given below along with a screenshot of the arcade game for comparison. I think yellow is more readable on a blue background. Yeah, that's what I thought but wanted to seek opinions. Talking of opinions, am I the only one who thinks that the rocks you have to shoot look more like fireballs in the CV version? 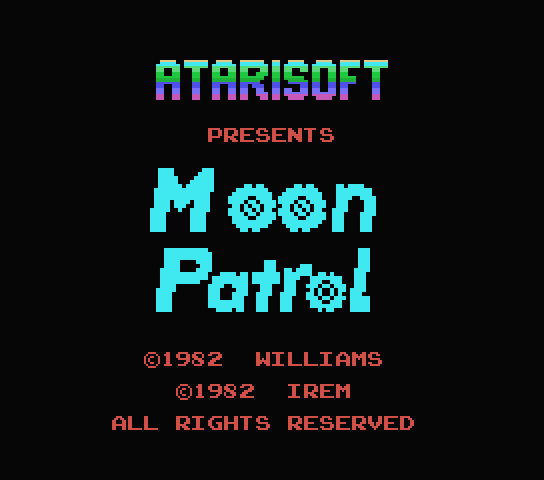 I was thinking of adjusting the graphic to make it look more like that in the arcade version. Thoughts? I say go for it. The new graphic looks great. 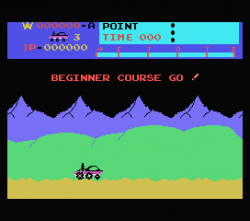 Sorry - I should have made it clear, the graphic on the right is from the arcade version and is two colour and 14x12 in size. The CV version is a single colour (with transparent holes) and is 8x8. 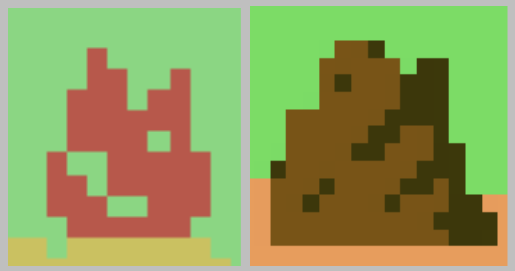 The second one is the best, IMHO, but you need to put a red pixel in the lower left corner to have a square corner like the arcade version of the rock. Own a rare piece of Atari history! A working CX-2000 Prototype!